Join us for a joyful evening of Springtime-fueled revelry as we celebrate the innate fecundity of our students and community. 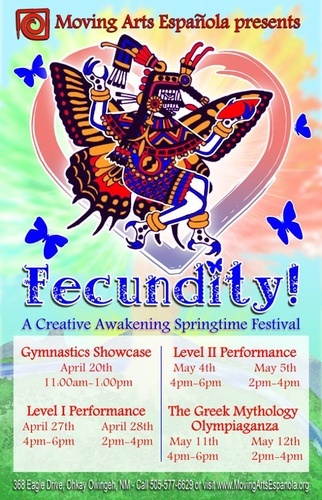 Fecundity––creative fertility, the ability to produce many new ideas, prolific––is exactly what our students are capable of. Through their work at Moving Arts, they are helping toil the earth of the Española Valley and surrounding communities making way for a new harvest of hope What better reason to celebrate! The evening will not only feature beautiful folklorico and classical ballet variation performances by Moving Arts Española students, but also a spectacular menu by board member, Chef Derek Rugsaken of Southeast by Southwest. *** Chicken or tofu satay with peanut sauce Thai salad with chili lime dressing Red chile vegetable curry with rice Thai fried noodles Sweet sticky rice with mango *** There are a very limited number of seats available for this special event, be sure to reserve yours today.